I've written a few times about my introduction to algo trading but Id like to share, perhaps again, how it all started for me. I was living in Connecticut in the U.S. in the early to mid 1980s. I read an article in the newspaper, probably the New York Times - I miss those newspapers that I loved but never read anymore - about artificial intelligence. I immediately thought how wonderful it would be to use that for trading. I then came across the name "David Aronson". I can't remember where or how but it was in relation to a new idea called "optimization of trading systems". I put the two together and contacted David Aronson and set up a meeting in New York City, just a short train ride from where I lived at the time. Cutting short the story of a very interesting meeting with Dave who was yet to become well known, he told me he could optimize any trading system I designed using the indicators I was using in my CompuTrac group then running mostly on Apple II hardware but transitioning to the new IBM Compatible. Sadly, the price of just one optimization was $25,000 as he was using a mini or mainframe computer and had to program my strategy from scratch. I passed. Luckily, I then came across Bob Pardo who had just releases software for sale that ran on the "new" IBM compatible and could optimize a trading system albeit mostly using moving averages and Wells Wilders new indicators, if I remember correctly. I went out and bought my IBM Compatible which was a Compaq so=called portable if you were strong enough.I ended up helping Bob run some research. As thanks, he sent me a Xmas basket which was mostly full of Comice pears. And that's why after a day of successful algo trading I immediately think of Comice pears and want one. 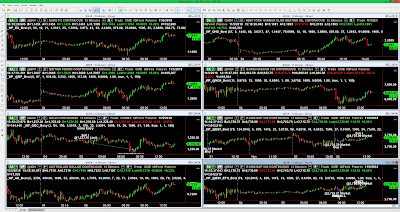 Here's a screen grab of one of the many portfolios of algos I am currently running. The idea is to run as many different algos as possible to smooth out my equity curve. However, its up to you whether you want to spread out your risk in as many baskets as possible or to put all your eggs in one basket and watch that basket very carefully. 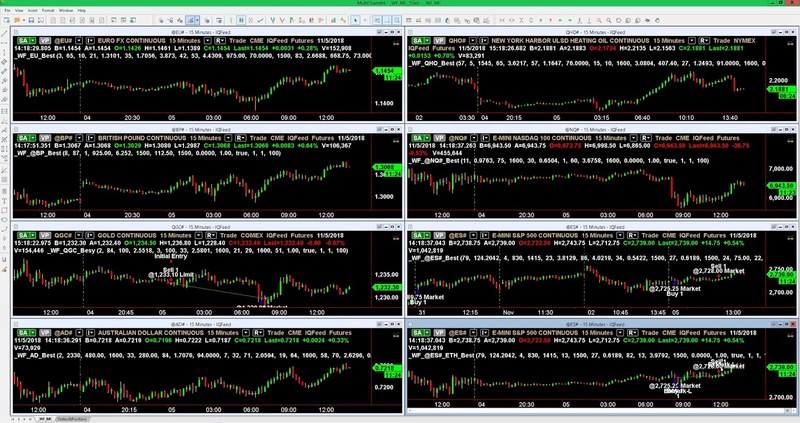 As you can see, this portfolio runs eight different algos each trading just one contract. Today's run produced just 3 trades - the other algos didn't find a trade - and there were no losing trades today. The profit for the day was over $1,400. The margin was day trade margin. Stats for these algos showed max losses of about $1500 a trade and win rates between 60% and 75%.